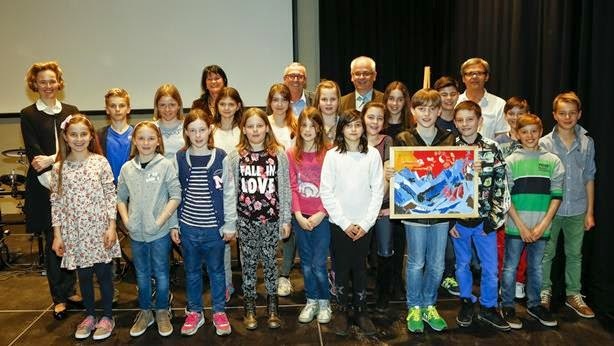 Today, Hereditary Princess Sophie was the opening speaker at an art exhibit presented by schools in Schaan. The event, with the motto "Lights on! ", is presented in support of those suffering from vision problems. Student artwork features bright colors, with the goal of bringing particularly vivid light and colors into the lives of those who face reduced vision. Photo and more information available from Volksblatt. Today, Hereditary Prince Alois received Alain Berset, a member of the Swiss Federal Council and the Interior Minister. Also in attendance to receive Berset were Prime Minister Adrian Hasler, Minister of Foreign Affairs Aurelia Frick, and Minister of Social Affairs Mauro Pedrazzini. Federal Councillor Berset was also in Liechtenstein to speak at the multi-country Unternehmertag event that is also being held in Voralberg (Austria) and the Rhine Valley region of Switzerland. Before his speaking engagement, he visited the government building with Prime Minister Hasler and signed a Memorandum of Understanding with Aurelia Frick to explore cooperative efforts in music education between Liechtenstein and Switzerland. Specifically, the two countries will be focusing on bringing music education into youth programs. Additionally, Federal Councillor Berset met with Mauro Pedrazzini for a working lunch, during which they discussed, among other things, the upcoming art exhibit Lohnmobil. Federal Councillor Berset will open the exhibit in St. Gallen, and it will be on view in Liechtenstein during August. No photos of Hereditary Prince Alois, but a photo of Alain Berset and Aurelia Frick, as well as more about the federal councillor's visit, here. The Order of Merit of the Grand Duchy of Luxembourg was created by Grand-Ducal decree on 23rd January 1961, which marked the 65th birthday of Grand Duchess Charlotte after five to ten years of discussion. It is the youngest of the Grand Duchy's orders. After the end of the second World War the Cour Grand Ducal as well as the Luxemburgish government saw the need to create an order to reward professional achievements or meritious services in other sectors. Before the Order of the Merit of the Grand Duchy of Luxembourg was created the Order of the Oak Crown was normally awarded for these kind of things, but between 1945 and the early 1960s it was awarded quite too often and the officials thought that the value of the order was risked. There are five grades of the order: Grand Cross, Grand Officer, Commander, Officer and Knight. In addition to the grades a silver-gilt medal is also annexed to the order. While the reigning Grand Duke or Grand Duchess is the Grand Master of this order, the Prime Minister serves as its chancellor. The badge of the Order of Merit of the Grand Duchy of Luxembourg consists of a cross with four white-enamelled armes with blue edges. 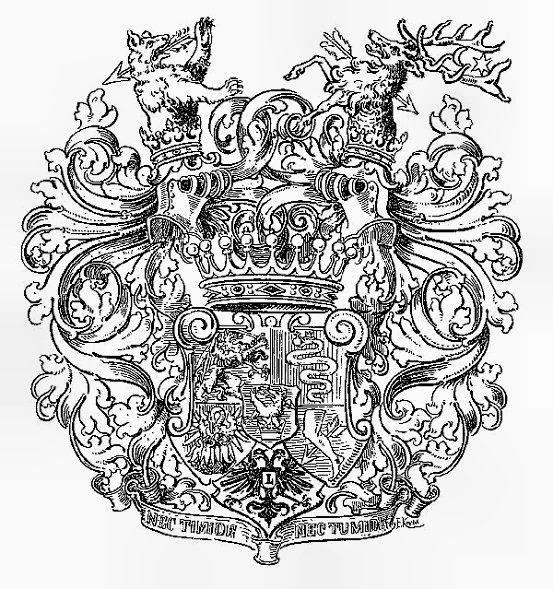 On the obverse, the central medallion bears the lion of the Grand Duchy. The lion is crowned, open-clawed and langued gold. It is surrounded by a laurel crown on a blue-enamelled Background. The reverse shows two golden, interlaced and gilded "C" for Charlotte and the grand-ducal crown on a red background. It is surrounded by a blue-enamelled border. ﻿﻿The plaque is a silver-gilt star with twelve rays. The badge of the order is in its centre. The ribbon is red with white and blue edges. The ribbon wideness varies between 105 mm for the Grand Cross to 37 mm for the other four classes. The medal is in silver-gilt and consists of a four-armed cross angled by five rays. The Order of Merit is awarded on National Day to deputies, state councillors, civil servants, elected representatives and personnel of municipal administrations, key players of the economic, social, cultural or sport sectors as well as volunteers. It can also be awarded to foreigners, though the foreign government has to approve. The silver-gilt medal is awarded to centenarians and acts of rescue. It is awarded by the Grand Duke with the countersignature of the Minister of State, who also nominates people for the order. It is considered to be the lowest of the Grand Duchy's orders, the Order of the Gold Lion of the House of Nassau being the highest. Yesterday afternoon, Prince Louis and his older son, Prince Gabriel, attended the general assembly of the Fédération Aéronautique Luxembourgeoise. The event took place at the Centre Culturel in Beckerich. Prince Louis has been the patron of the Luxembourgish aeronautic federation since 2011. Even in non-royal patronage life, the Grand Duke's third son is very interested in the matter: While living in the United States a few years ago, Prince Louis took courses in Aeronautics and Aeronautical Management and gained a "Private pilot certificate". No pictures are available yet but will be added if they do. There you go. Austrian geneticist Markus Hengstschläger was in Liechtenstein last night where he gave a lecture at the education forum in Triesen. Among the guests for the talk entitled "The average trap: Do we set false priorities?" was no other than Hereditary Princess Sophie. More on the lecture at Volksblatt. A week ago, on Friday March 20 to be precise, Grand Duke Henri and Grand Duchess Maria Teresa visited the fleeting exhibition L'Amicale des Amis. 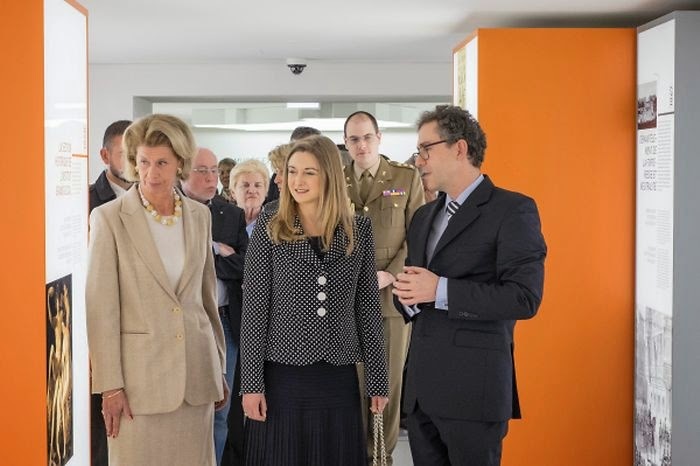 During their visit, the Grand Ducal Couple met with some creators of pavilions, designers and representatives of the Luxembourg Center for Architecture (LUCA). Together with the artists, they had an informal lunch exchanged ideas, stories and perspectives related to architecture and design of the Grand Duchy. A few more pictures on the websites of the cour and LUCA. 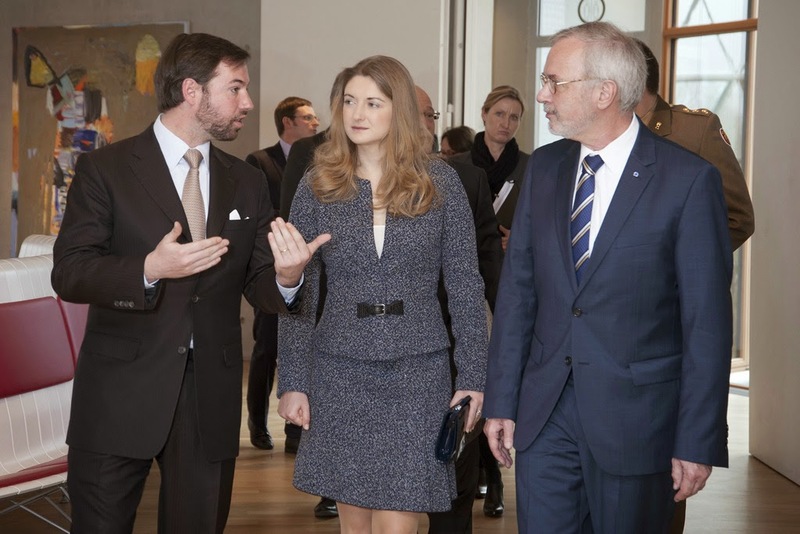 Today, Hereditary Grand Duke Guillaume and Hereditary Grand Duchess Stéphanie were in Kirchberg for a working visit to the European Investment Bank. The President of the Bank, Werner Hoyer, was there to welcome them for their visit. This banking-focused event comes on the heels of the hereditary grand ducal couple's recent visit to the Middle East to establish stronger financial ties between Luxembourg and countries in that region. The focus of the visit to the EIB was primarily about the bank's role in furthering the Investment Plan for Europe. No photos have shown up yet, but they'll be added here if they do. Photos now available on the EIB website. On Tuesday, Grand Duke Henri sent two letters of condolence, one to the President of Germany and the other to the King of Spain. Both letters expressed sadness for the tragic airplane accident that occurred in the French Alps. C’est avec une très grande émotion que la Grande-Duchesse et moi-même avons appris la nouvelle du terrible accident d’avion survenu aujourd’hui à Barcelonnette dans les Alpes françaises. Au nom du peuple luxembourgeois, nous Vous exprimons nos plus sincères condoléances. Nos pensées et nos sentiments de compassion les plus émus vont aux familles et aux proches touchés parce drame. It is with great emotion that the Grand Duchess and I have learned about the terrible airplane accident that occurred today in Barcelonnette in the French Alps. On behalf of the people of Luxembourg, we express our deepest condolences. Our thoughts and our greatest feelings of compassion are with the families and friends of those affected by this dramatic event. On March 17, St Patrick's Day that is, the Duke and Duchess of Cambridge were on hand for the annual Irish Guards’ St Patrick’s Day Parade in Aldershot during which the Duchess the traditional sprigs of shamrock to the Officers and Guardsmen on parade. 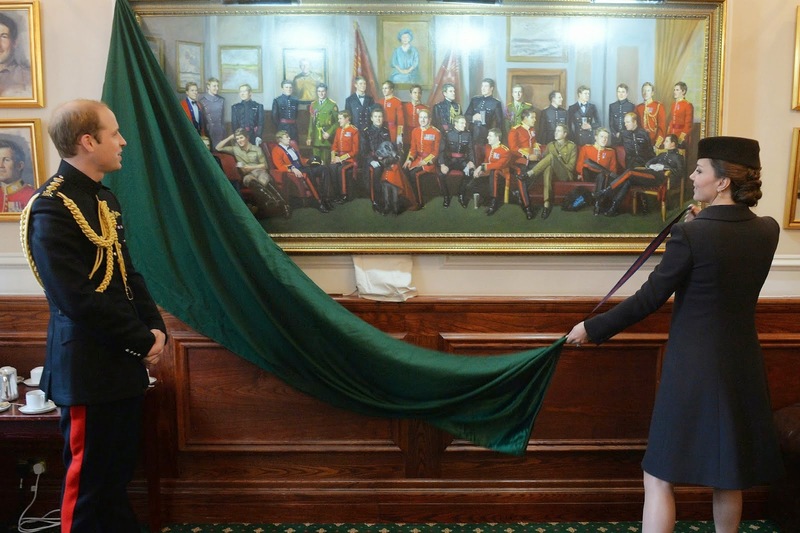 Together with her husband also known as Prince William she also unveiled a painting of some thirty Irish Guards officers by Lindy Allfrey. Prince Hans-Adam: "All My Sons Are Sensible. Much More Than I Am." Prince Hans-Adam has given an interview to Swiss Sunday newspaper Schweiz am Sonntag, which was published this weekend. In it, he talks about why the monarchy has such a great support in Liechtenstein's population, that he believes that monarchy will have a renaissance in these uncertain and changing times, and that his sons are much more sensible than he ever was attesting them diplomatic skills he does not have himself. The full interview is available here. It also mentions that Prince Hans-Adam recently attended an alumni event by his alma mater University of St. Gallen. On Friday, Grand Duchess Maria-Teresa received in audience historian Charles Barthel, who is also the author of Au service de l’humanité – Histoire de la Croix-Rouge luxembourgeoise. This history of the Luxembourg Red Cross honors the organization's Centenary celebrations. Additionally, the Grand Duchess received the steering committee that is planning the different festivals and activities to mark the 100th anniversary. Maria-Teresa has been the president of the Luxembourg Red Cross since 2005 and will mark her 10th anniversary in that position on April 8th of this year. Additionally, she chairs the organization's Board of Directors, as well as the Executive Committee. Then later in the afternoon, Grand Duchess Maria-Teresa received in audience Oswald Schroeder and Tom Bellion. Mr. Schroeder is the vice-president, and Mr. Bellion the director, of the Luxembourg City Tourist Office (LCTO), and they received a check for the revenues received from guided tours of the Palais Grand Ducal. The funds will be donated to the Fondation du Grand-Duc et de la Grande-Duchesse. No photos so far. But they'll be added if any are made available. Photos from the Cour website here and here. The 25th Crans Montana Forum took place between March 12 and March 14 in Dakhla, a city in Western Sahara under Moroccan control. Founded in 1986 in Crans Montana, the Swiss organisation's aim is to give a platform for direct contacts between business, government and political leaders of from around the world. This year's forum was themed “South-South cooperation and the development of Africa” and counted King Mohammed VI of Morocco among its speakers. 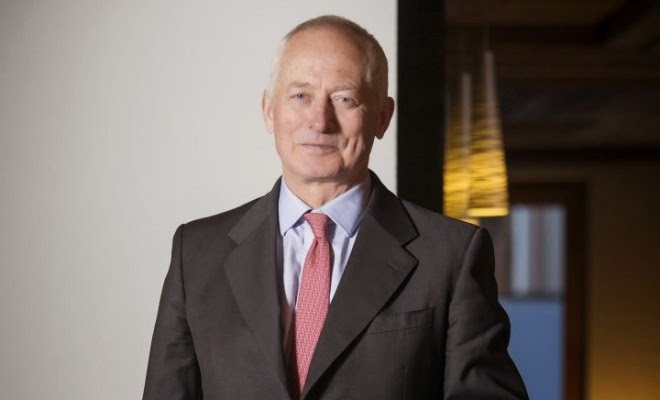 Now finally getting to the point why this point made it onto the blog: Prince Jean, who has long been involved with the Crans Montana Forum, also was in Morocco for the occasion. Other regular and not-so-regular Luxarazzi faces involved with the organisation include Hereditary Prince Alois as well as his second cousin once removed Prince Anton of Liechtenstein. 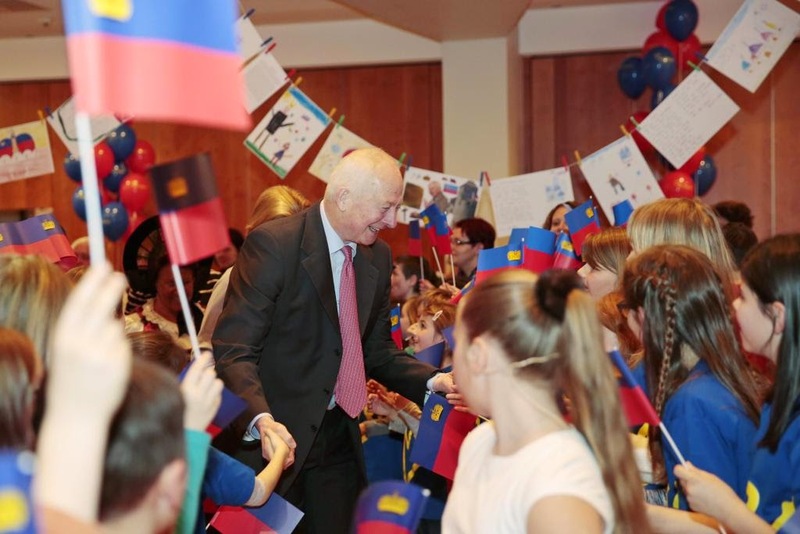 According to reports, a Prince Georg of Liechtenstein was also present for this year's event. I'm inclined to believe it was Prince Anton's son as Hereditary Prince Alois' son Georg is probably a bit too young to appreciate such an event. Yesterday, Prince Guillaume and Princess Sibilla attended a memorial mass for Prince and Duke Ernest-Charles d'Arenberg who was killed in battle on March 21, 1915, fighting for France during the First World War. The memorial mass took place at the Cathédrale Saint-Louis des Invalides in Paris. The scion of the French branch of the family was married to Thérèse de La Rochefoucauld d'Estissac, who died in 1958. According to this 1915 New York Times article he was the 10th member of the French aristocracy to die in World War I.
Getty Images has a gallery of visuals of the mass also attended by a number of other royals and nobles. 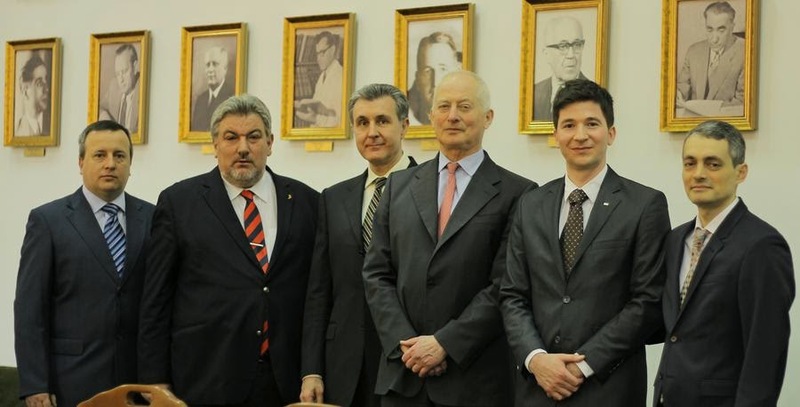 A delegation of members of Liechtenstein's Landtag, the Principality's parliament, was in Vienna and South Moravia for a working visit between March 16 and March 18. During their visit they were accompanied by Liechtenstein's ambassador to Austria and the Czech Republic, Maria-Pia Kothbauer, Princess of Liechtenstein. The grouo of MPs, which also included the President of Parliament Albert Frick, also met with a more familiar princely face to this blog, Prince Constantin. He gave them a tour of Schloss Wilfersdorf in Lower Austria. The castle has belonged to the Princely Family since 1436 and is famous for its wine cellars. 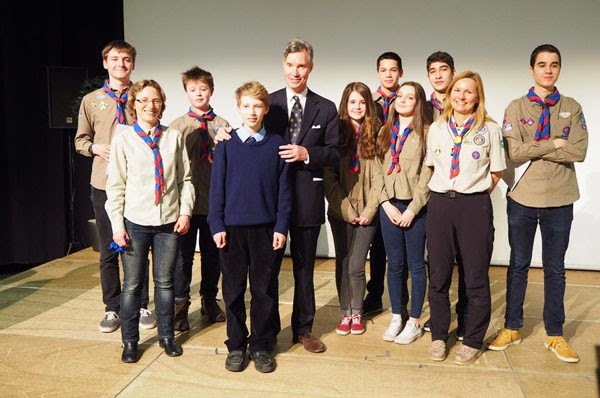 Last night Grand Duke Jean and his youngest son, Prince Guillaume, as well as his youngest grandson, Prince Jean, son of aforementioned Prince Guillaume, were on hand to hand out this year's Mérite Jeunesse at the Forum Geesseknäppchen. While Luxembourg's former Grand Duke is the patron of the Mérite Jeunesse, an organisation and award similiar to The Duke of Edinburgh's Award, Prince Guillaume works as the president of the administrative board. The young Prince Jean was probably simply there to join his father and grandfather. Also present was Claude Meisch, Luxembourg's Minister for Education, Children and Youth. A few days ago, Hereditary Prince Alois was interviewed by a group of seven international students studying at the University of Liechtenstein. The aim of their interview series is to draw a picture of Liechtenstein from an internal and external point of view. To do so, they talked a number of political issues. The full interview (in English) can be found here. Prince Max is currently on a visit to Bahrain. In his capacity as CEO of the LGT Group he met with the Crown Prince of the island kingdom in the Persian Gulf, Sheikh Salman bin Hamad bin Isa Al Khalifa, at at Gudaibiya palace to talk finance and business. They also touched on the subjects of Bahrain-Liechtenstein relations, the LGT Group's involvement in the region and ongoing economic reforms in Bahrain. 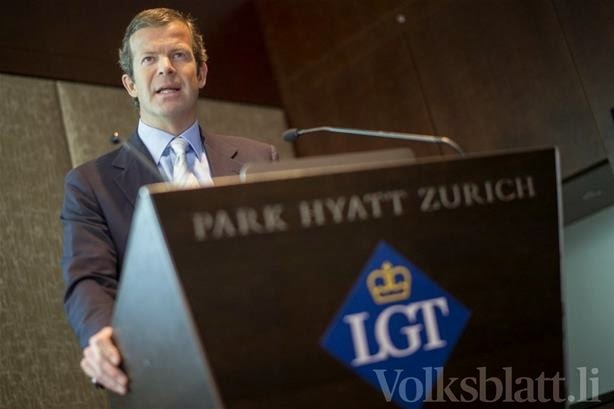 The LGT is the world's largest private banking and asset management group. 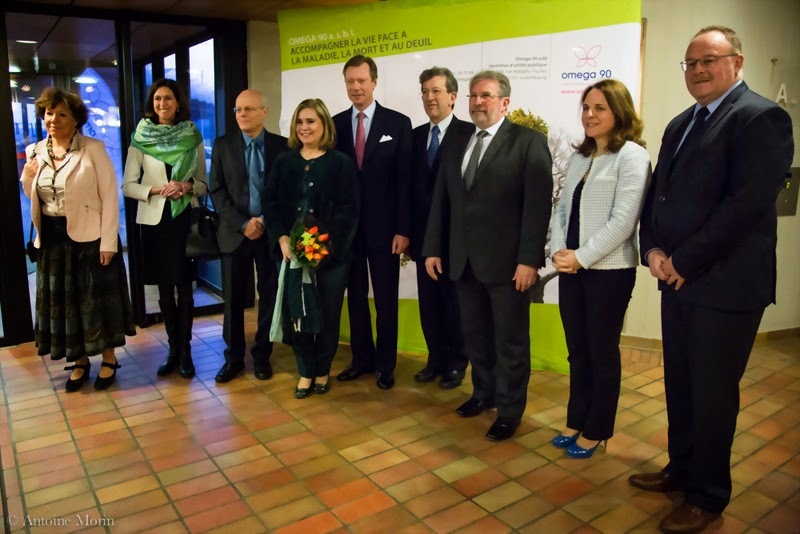 Yesterday, Grand Duke Henri and Grand Duchess Maria-Teresa were at the Conservatoire de la Ville de Luxembourg to attend the academic session honoring the 25th anniversary of Omega 90. Also in attendance were Mars di Bartolomeo, the President of the Chamber of Deputies; Romain Schneider, the Minister for Cooperation and Humanitarian Action; Lydia Mutsch, the Minister of Health; and Corinne Cahen, the Minister of Family and Integration and the Greater Region. No photos from the event yet, but they'll be added if anything becomes available. UPDATE: Photo added, with more at the Cour website. Not many castles in this world can probably pride themselves in being the name giver of an entire country. A country that is about 500 kilometres beeline (that's about 310 miles) away at that. 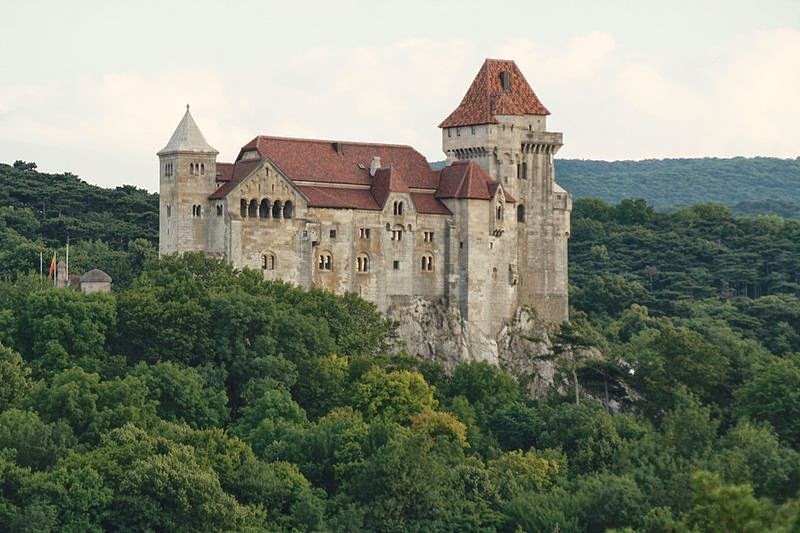 However, Burg Liechtenstein located in Maria Enzersdorf south of Vienna can boast such an unique characteristic. It first gave its name to the noble Liechtenstein family and through them to what today is known as the Principality of Liechtenstein. Literally meaning "bright stone castle", the origins of Burg Liechtenstein lie in the 12th century. It was built around the year 1130 as an extensive castle complex and not as often described, a fortified tower featuring a chapel. Its builder was no other than Hugo von Petronell, progenitur of the Princely House of Liechtenstein who later took his name from the castle. A Roman chapel as well as some mostly heavily revised walls from the 12th century are still in existence. Between the 13th and 15th centuries, the Burg was revised and expanded multiple times. The material was mostly taken from the Römersteinbruch stone pit in Sankt Margarethen im Burgenland famous for the lightness of the stones, hence the name Liechtenstein. 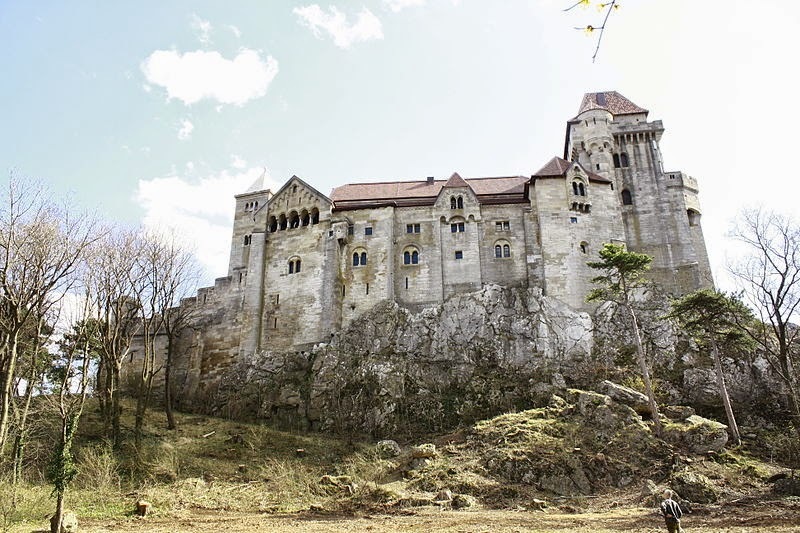 During the second half of the 13th century the Liechtenstein family, however, lost possession of the castle based on inheritance and during the following centuries it went through many different hands until it came back into possession of the Liechtensteins, where it remains to this day. In 1350, the castle was owned by the noble Wallsee family and in 1367, by Ulrich de Pair. In 1384. the Stadecks pledged Burg Liechtenstein to Counts Wilhelm and Hermann of Cilli. Until 1477 it was owned by Count Knight Hans of Holobarzy, when it fell into the hands of Matthias Corvinus, King of Hungary and Croatia. Later it was also owned at different points in time by Konrad Auer of Herrenkirchen, Holy Roman Emperor Matthias I, the Prüschenk brothers as well as Bartholomäus Freysleben before it was destroyed during the Siege of Vienna by the Ottoman Empire in 1529. 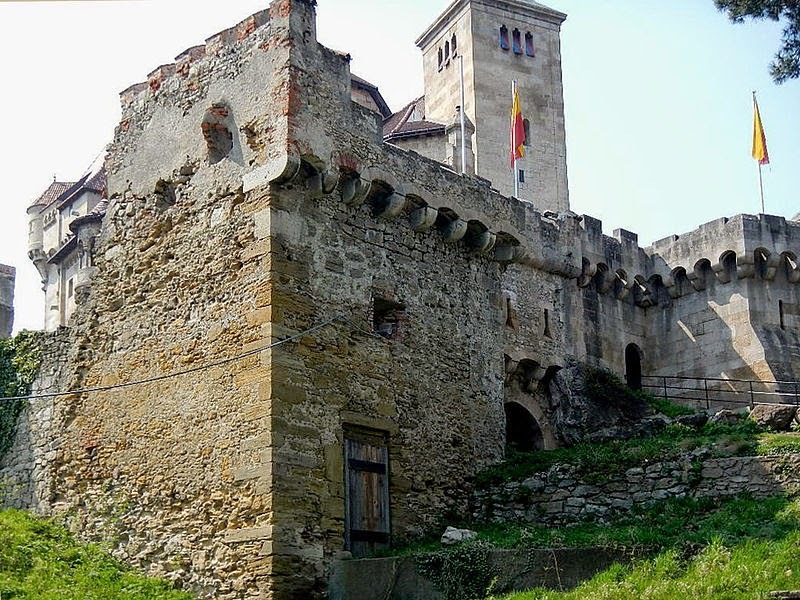 Already in 1480, the Burg had been heavily damaged by the Ottomans. After the end of the Siege, the remains of the castle were given back to the Freysleben family requiring them to rebuilt it. In 1569, it was owned by Baron Andreas of Pögl, then his brother-in-law Wilhelm of Hofkirchen as well as the Barons of Aichelberg. In 1592, Count Hans of Khevenhüller-Frankenstein received Burg Liechtenstein as a fiefdom. Like his other estates, the castle was administered by Georg Wiesing. Wiesing built a Meierhof, a farm or building occupied by the administrator (the Meier) of a noble or ecclesiastical estate, in place of today's Schloss Liechtenstein. In 1606, the castle was once again heavily damaged during yet another Siege of Vienna under the leadership of Stephan Bocskai. In 1613, the Khevenhüllers received the castle as an allod. However, it was once again destroyed during the Battle of Vienna in 1683. In 1684, the noble Waffenberg family bought the ruins. In 1777, Baron Josef of Penkler became the owner of Burg Liechtenstein and while he made the castle accessible via staircases and aisles, he did not have the necessary money to carry out renovation works. 22 years after Penkler purchased the castle, he sold it to Prince Stanislaus of Poniantovsky. And in 1806, the castle finally came back into the possession of the family who had once taken its name from the Burg: It was Prince Johann I of Liechtenstein who purchased his family's ancestral home. In the following years, he had a nature park created around the ruined castle. He also commissioned a romantic restoration of the castle, which, however, was halted when architect Joseph Hartmuth died in 1816. During the second half of the 19th century, Prince Johann II had Viennese architect Carl Gangolf Kayser rebuilt Burg Liechtenstein in accordance with the ideas of historism. After Kayser's death, his plans were finished by Humbert Walcher Knight of Moltheim and Egon Rheinberger. The works on the castle were finished in 1903. Towards the end of the Second World War, the Burg was heavily damaged once again and the archives and furnishings looted by the Soviets. Some renovations works on the castle were carried out between 1949 and 1953. Between 1968 and 2007, Burg Liechtenstein was administered by the municipality of Maria Enzersdorf and used by the local boy scouts. As the municipality could not afford the necessary renovation works, the lease was ended in 2007 and the Prince Liechtenstein Foundation, which also owns many other Austrian properties of the Princely Family including the Stadtpalais, the Gartenpalais as well as the Sommerpalais, took over management. For the following two years, the Burg was closed to the general public due to security concerns. In 2008 and 2009, the castle was renovated and given a new roof. 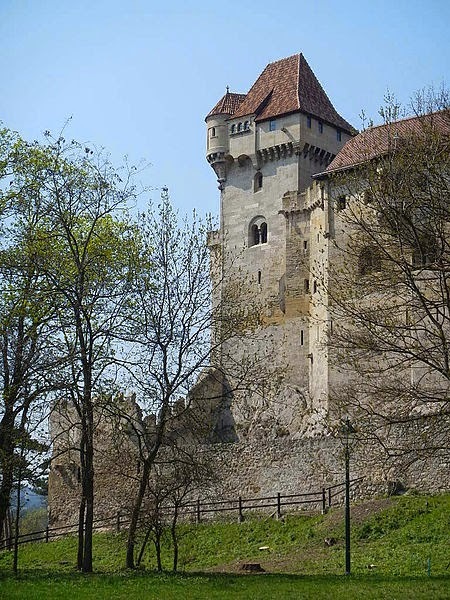 In the spring of the following year, Burg Liechtenstein was once again opened to visitors. 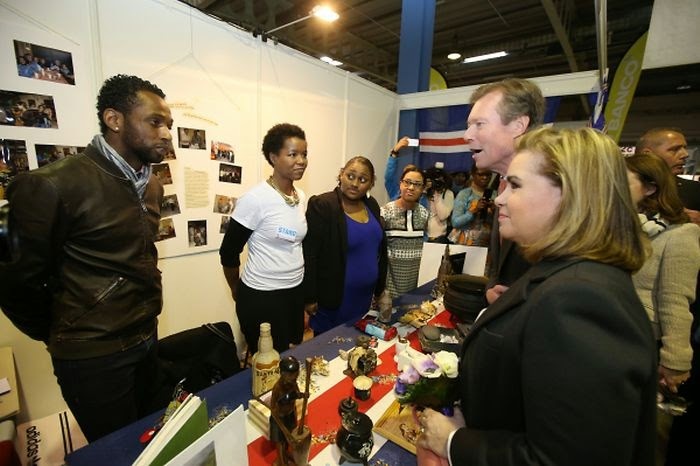 Grand Duke Henri and Grand Duchess Maria Teresa were out and about today visiting the 32nd edition of the Festival des migrations, des cultures et de la citoyenneté at Luxexpo. The festival of migration, cultures and citizenship, which was already also visited by the Hereditary Grand Duke two years ago, features around 400 stands representing literature, music, food, dance and more from countries all over the world. It runs until Sunday evening. Pictures of the day at Wort and RTL. 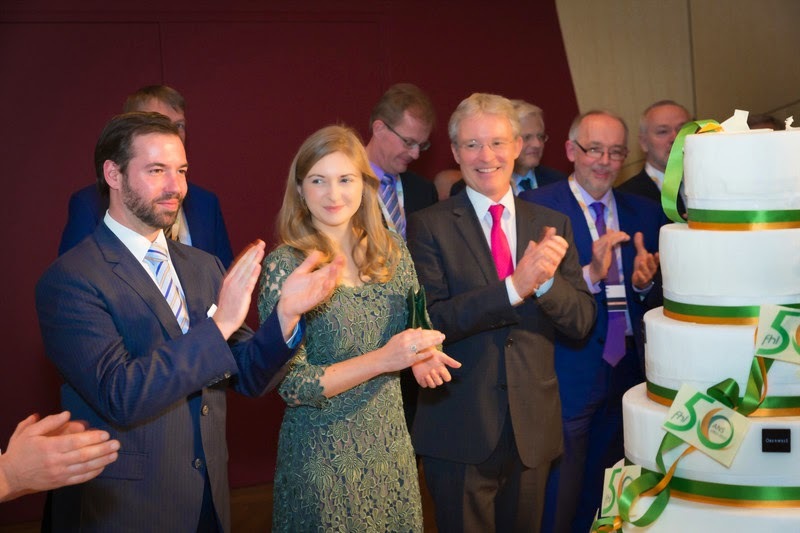 On Wednesday evening, the Fédération des Hôpitaux luxembourgeois celebrated its 50th anniversary with an event at the Philharmonie in Luxembourg-Kirchberg and Hereditary Grand Duke Guillaume and Hereditary Grand Duchess Stéphanie were on hand to celebrate with them. The hospitals federation comprises of ten hospitals, which operate a total of 2,730 beds for acute care and average-term stay, including 109 geriatric rehabilitation beds. It employs more than 9,000 staff and doctors. Their anniversary event was used to revisit the history of the hospital sector in Luxembourg and discuss the many challenges of the future. More pictures at the cour. 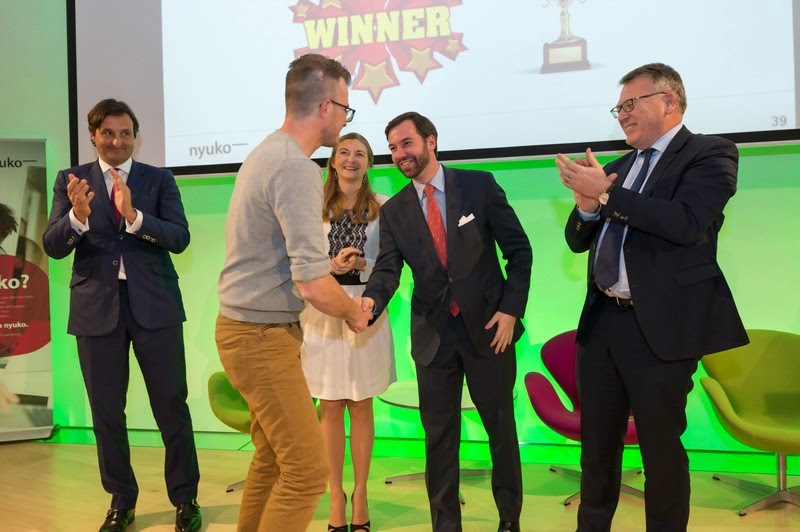 On Thursday night, Hereditary Grand Duke Guillaume and Hereditary Grand Duchess Stéphanie were among the guests for the 3rd annual 1,2,3 GO SOCIAL award that encourages innovation with a social emphasis. For the event, the Hereditary Grand Duchess wore a repeated dress by Sandro and a pair of earrings I'd love to get a better look at. A few more visuals can be found at the cour and Chronicle. 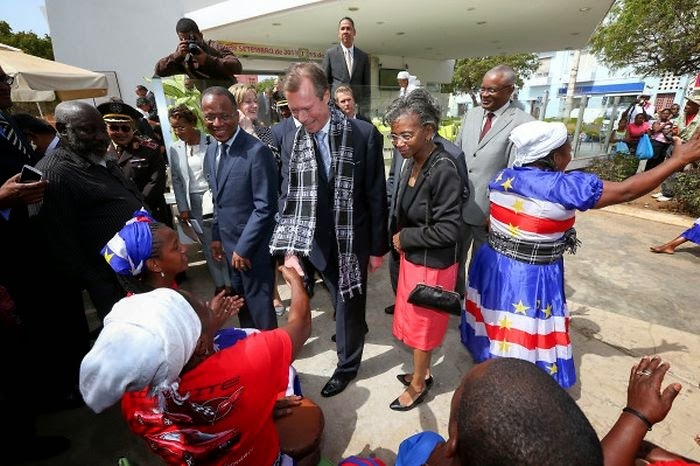 On Wednesday and Thursday of this week, Grand Duke Henri wrapped up his official visit to Cape Verde. 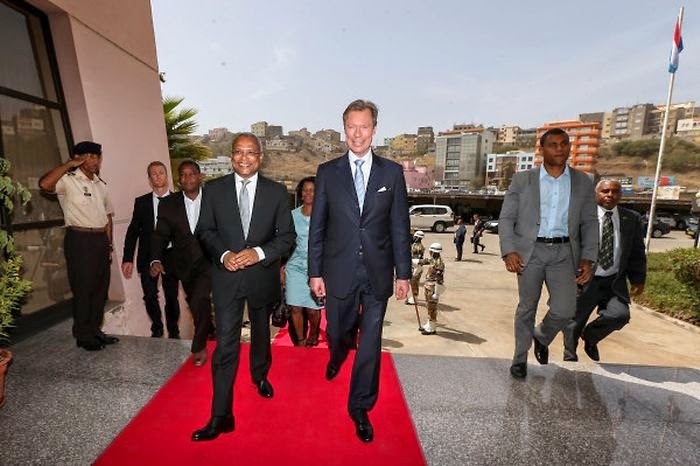 Highlights of the second and third day of his visit included some sightseeing in Cidade Velha, the old capital of Cape Verde near its current capital Praia, as well as on the islands of Sao Vicente and Santo Antão on Wednesday, and the signing of a new cooperation agreement between the Luxembourg and Cape Verde. The island nation in the Atlantic ocean has been a preferred partner of the Grand Duchy's foreign aid for many years. 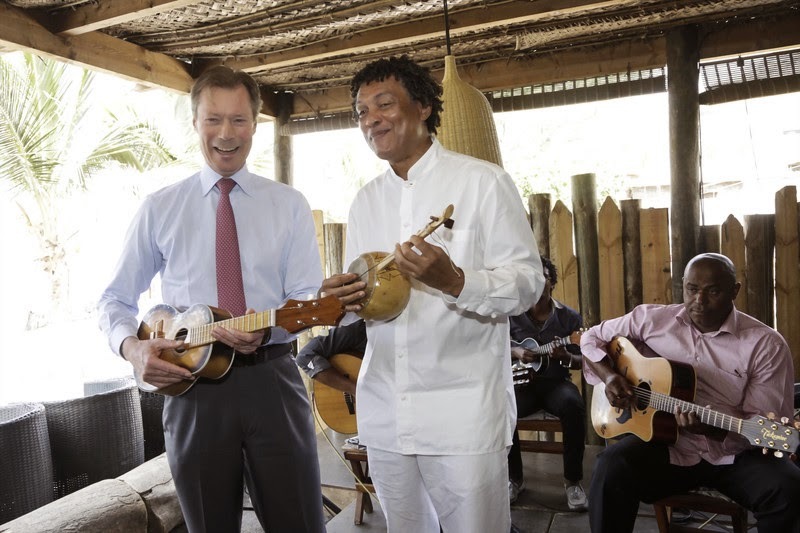 For more information, pictures and videos of the Grand Duke's Cape Verdean adventures, have a look at RTL, Wort #1, Wort #2, Wort #3, Tageblatt, the government and the cour. Hereditary Prince Alois received for new ambassadors to Liechtenstein at Schloss Vaduz today. Marios P. Ieronymides from Cyprus, Paulo Tiago Jeronimo da Silva of Portugal, Jorge Alberto Meyer Long of Uruguay and Silvia Marchetti of San Marino all presented their letters of credence to the Principality's regent during their respective audiences. In advance, all of them had met with Liechtenstein's Minister of Foreign Affairs, Education and Culture, Aurelia Frick. 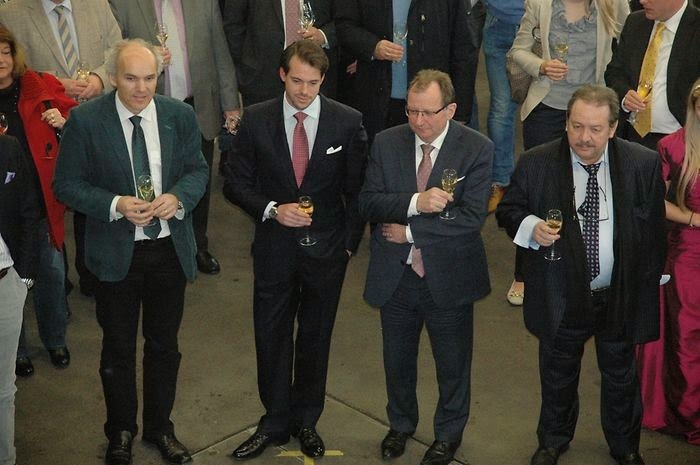 Yesterday, Prince Felix participated in the official opening of Waïkues am Norden 2015 at Däichhal Ettelbruck. The event showcased more than 300 wines from 25 winemakers, among them wines from Prince Felix and Princess Claire's vineyard Château Les Crostes. Accompanying Prince Felix at the event was Fernand Etgen, the Minister of Agriculture, Viticulture and Consumer Protection. Today at noon, Prince Hans-Adam II was awarded two titles at Babeș-Bolyai University in Cluj-Napoca, Romania: honorary professor and honorary senator. The award was proposed by the university's Faculty of Business to recognize Prince Hans-Adam for his focused efforts in international trade and financial improvements, among other achievements. The official statement from the school reads, in translation: "in recognition of his outstanding contribution in the field of academic research to develop the classical principles of self-determination, democracy and free international trade, as well as substantial financial support to Romania to strengthen bilateral cooperation between the two countries". See here for the original, in Romanian. The Faculty of Business lecturer Ioan Alin Nistor, who is standing second from the right in the photo above, presented the award. Babeș-Bolyai University is the largest university in Romania, with nearly 40,000 students, and is ranked as one of the best higher education institutions in that country. UPDATE: Some more photos from the Romanian press. It should be noted that Prince Radu was there as well (and photographed above). Hereditary Grand Duchess Stéphanie paid a visit to the Musée National d'Histoire et d'Art, or simply MNHA, today. Together with Les Amis des Musées d'Art et d'Histoire Luxembourg, she was given a tour of the newly renovated Wiltheim wing of the museum for history and art. While the museum's new wing will be officially opened to the public on March 19, members of Les Amis des Musées d'Art et d'Histoire Luxembourg were given sneak peak of it today. The Hereditary Grand Duchess has been the patron of the friends' association of several state museums since March 2013. During the last four years, the Wiltheim wing of the MNHA was renovated for around four million euros after it was became apparent in 2008 that the building was liable to collapse. In the future, the renovated wing will house four different exhibitions as well as an Atelier pédagogique for educational workshops for children. A few visuals of the visit at Wort. 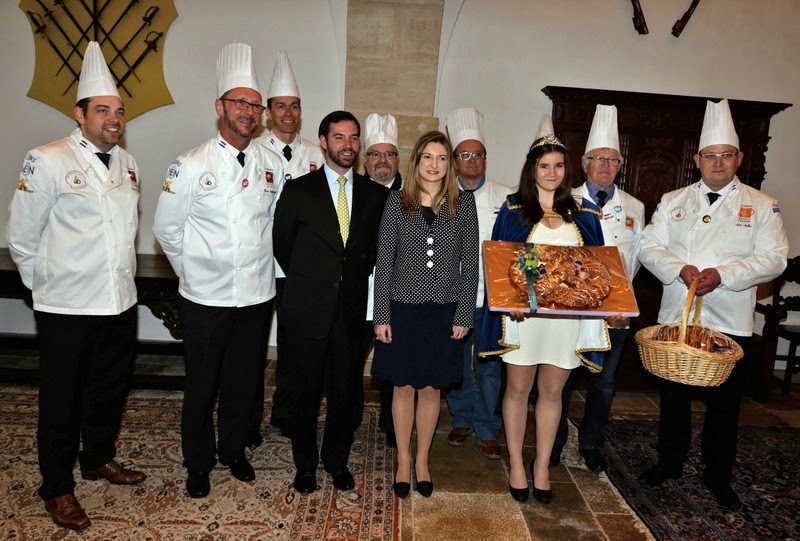 Today at the Palais Grand Ducal, Hereditary Grand Duke Guillaume and Hereditary Grand Duchess Stéphanie were presented with a pretzel from the Fédération des Patrons Boulangers-Pâtissiers du Grand-Duché de Luxembourg, in honor of Bretzelsonndeg 2015. The pretzel represents an Easter tradition unique to Luxembourg and part of Bretzelsonndeg, or Pretzel Sunday, which is the fourth Sunday of Lent. According to tradition, this Sunday is an opportunity for young men to demonstrate their interest in young ladies by giving them a decorated pastry in the shape of a pretzel. In the event that the young lady reciprocates the interest, she can give the young man a chocolate egg in return, on Easter Sunday. The size of the response gift also tends to correspond to the original: that is, the young lady gives a large egg if the young man has given her a large pretzel cake. However, the tradition states that everything is reversed during a Leap Year: the young lady presents the pretzel, while the young man presents the chocolate egg. This particular exchange of gifts may have originated with young people expressing their interest in one another, but it's now more universal, and married couples also participate (with the assumption that, among spouses, the chocolate egg is always given in response to the pretzel). 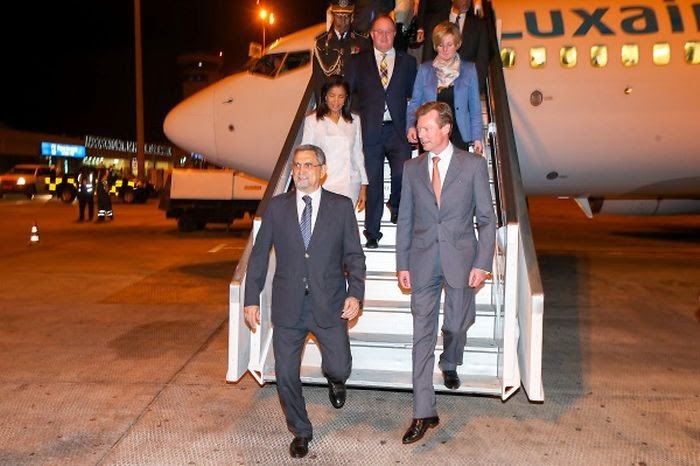 Last night Grand Duke Henri arrived for his three-day official visit to Cape Verde in the island country in the middle of Atlantic Ocean some 30 minutes early. He and his delegation, which includes Romain Schneider, Minister for Cooperation and Humanitarian Action, as well as Francine Closener, Secretary of State in the Ministry for the Economy, were welcomed at Praia airport by President Jorge Carlos Fonseca and his wife, Lígia. Although they already arrived last night, the real programme of the official visit kicked off this morning. Thus another official welcome of the Grand Duke at the presidential palace in Praia was in order this morning. It was followed by private talks between Grand Duke Henri and President Fonseca as well as enlarged talks also including the Grand Duke's political delegation. The Luxembourg delegation was then received by the mayor of the capital Praia, Ulisses Correia e Silva, who offered the keys to the city to Grand Duke Henri. In the late morning, the Grand Duke laid a wreath of flowers at a monument dedicated to Amílcar Cabral, founder of the African Party for the Independence of Guinea and Cape Verde. 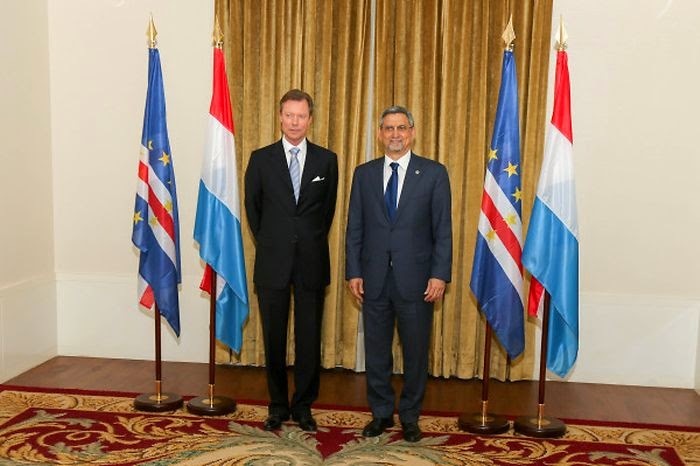 Afterwards Grand Duke Henri met with the Prime Minister of Cape Verde, José Maria Neves. Their exchange also attended by Minister Schneider and Secretary of State Closener was followed by a lunch hosted by the Prime Minister in the banquet room of the government palace. After luncheon, the Grand Duke attended a special session of parliament, during which he gave a speech, and also had the chance to meet the President of the Surpreme Court of Justice. These political meetings were followed by the inauguration of the Centre for Renewable Energy and Industrial Maintenance (CERMI), a project co-financed by the Grand Duchy, as well as an economic forum. 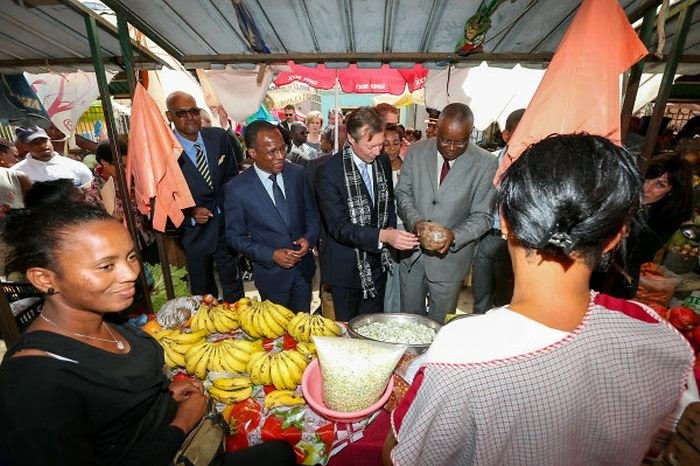 Grand Duke Henri was also given the chance to discover a bit of the capital of Cape Verde, Praia, by visiting a local market. The day's event will be rounded off by a gala dinner hosted at the presidential palace tonight. Pictures of yesterday and today at Wort #1, Wort #2, Wort #3, Tageblatt, L'essentiel and the government. 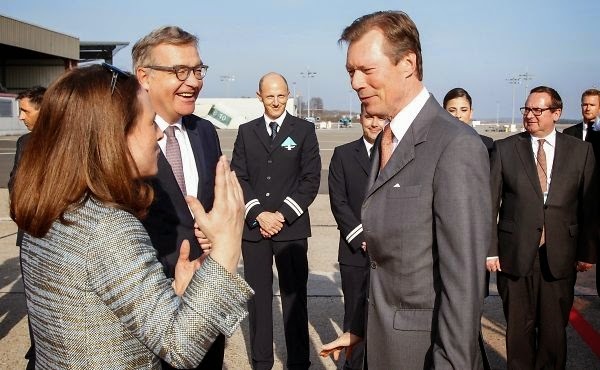 Grand Duke Henri departed Luxembourg earlier today for his three-day official visit to Cape Verde. The Grand Duke and his delegation including Romain Schneider, Minister for Cooperation and Humanitarian Action, Social Security, and Sport as well as Francine Closener, Secretary of State in the Ministry of the Economy, were seen off at Findel Airport by Laurent Mosar, Vice President of the Chamber of Deputies, and Corinne Cahen, Minister for Family and Integration. A news report of the departure plus a country profile of Cape Verde is available at RTL (starting at 12:55). More pictures at Wort and Tageblatt. For the second Sunday in a row, Hereditary Grand Duke Guillaume was on hand to hand out some diplomas yesterday. 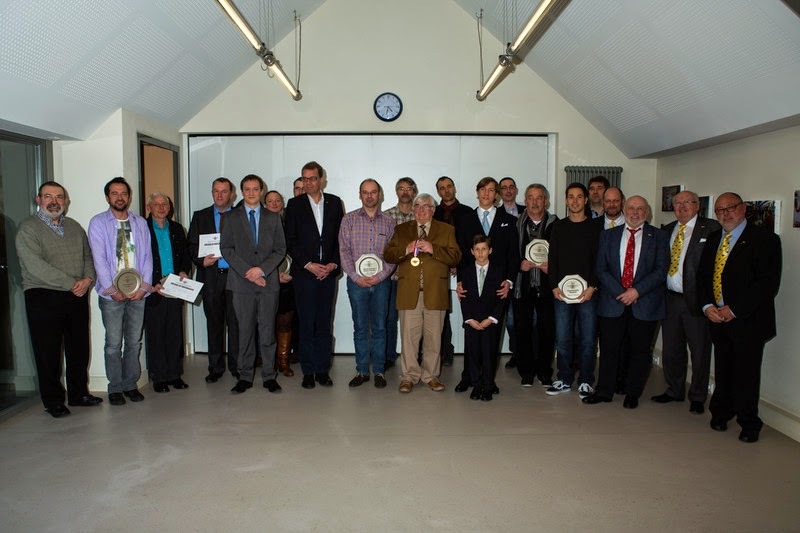 This time around the diplomas went to Luxembourg's newest master craftsmen as well as to awardees of the Promotion du Travail. The event took place at the Grand Théâtre. For the occasion, the Hereditary Grand Duke was accompanied by the Minister for Labour Nicolas Schmit and Secretary of State in the Ministry for Children and Youth, Higher Education and Research, and National Education. RTL has a video of the event (skip ahead to 8:20) and the cour pictures. 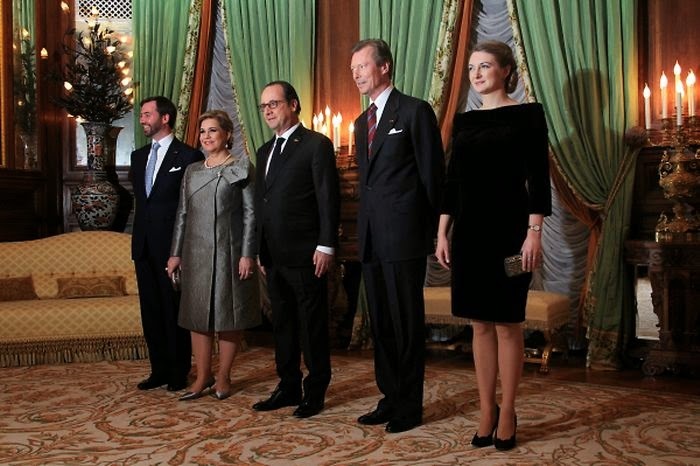 In a bit of a nice surprise, the Grand Duke and Grand Duchess hosted an official dinner for French President François Hollande at the palais this evening to round off his official visit. They were also joined for the event by Hereditary Grand Duke Guillaume and Hereditary Grand Duchess Stéphanie fresh off their economic mission to the Middle East. More pictures of the dinner at Wort and Tageblatt. 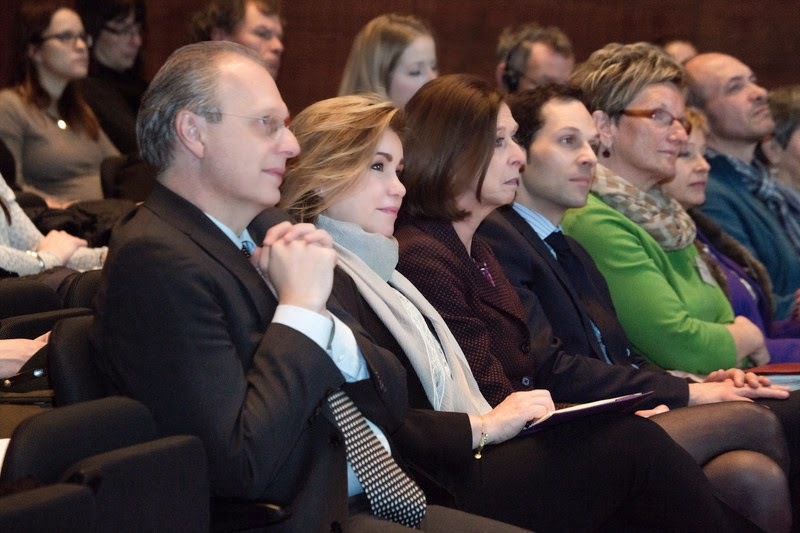 Yesterday morning, Grand Duchess Maria Teresa was among the guests for a conference entitled "Domestic violence in Luxembourg" at the cultural centre opderschmelz in Dudelange. She was accompanied by the Minister for Equal Opportunities and Minister for Health, Lydia Mutsch. The conference was organised on the occasion of International Women's Day coming up on March 8. Its main aim was to present and discuss the results of a recent study on the matter of domestic violence by the Luxembourg Institute of Health (LIH). Bienvenue, Monsieur le Président: François Hollande, the President of France, was in Luxembourg for an official visit today. He was welcomed by Grand Duke Henri and Grand Duchess Maria Teresa with military honours in front of the palais grand-ducal this morning. This was followed by a private meeting in the palace. 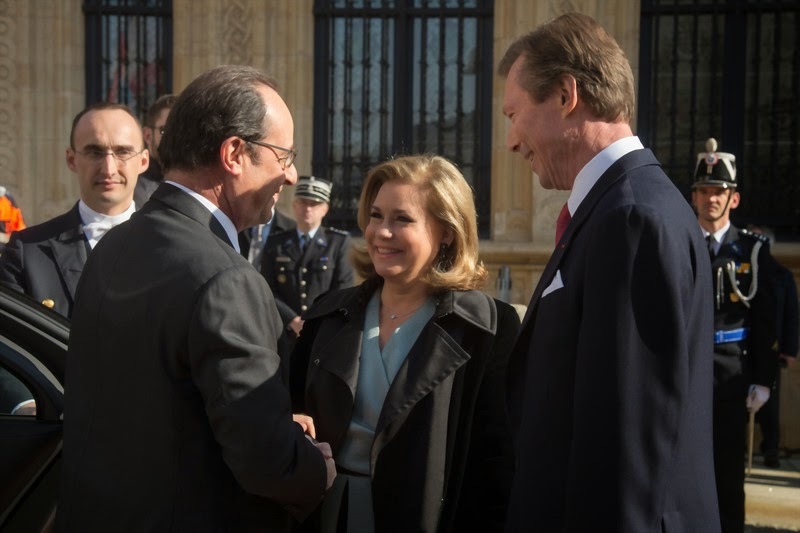 After the laying of a wreath of flowers at the Monument National de la Solidarité Luxembourgeoise, President Hollande also had political and economic meetings. In the afternoon, he visited SES, a global satellite owner and operator based in Betzdorf, as well as the Belval-branch of the University of Luxembourg. He was accompanied by the Grand Duke for those visits. Pictures and videos of the day at Wort, Tageblatt, L'essentiel, RTL and the cour. Today, Hereditary Grand Duke Guillaume and Hereditary Grand Duchess Stéphanie were in Dubai for their ongoing visit to the Middle East. Luxembourg's Minister of Finance, Pierre Gramegna, has accompanied the hereditary grand ducal couple as part of a 60-person financial delegation to strengthen ties between Luxembourg and Islamic banking institutions. They were received by Sheikh Hamdan bin Rashid Al Maktoum, who is the Deputy Ruler of Dubai and the Minister of Finance for the United Arab Emirates. Additionally, they met with Obaid Humaid Al Tayer, the UAE Minister of State for Financial Affairs. The day's events included a seminar entitled "Dubai and Luxembourg: Partnering to Bring you Global Opportunities" which was organized jointly by Luxembourg for Finance and Dubai International Finance Centre. Among the purposes of the seminar is presenting Luxembourg as a leading center for Islamic finance in Europe, as well as discussing evolving financial technologies. The next stop for the Luxembourg financial delegation is Qatar, on March 4th and 5th. More photos on the Cour website, and further information about the visit on Wort. Some postings on Twitter can be found here, here, and here. UPDATED: While in Dubai, Guillaume and Stéphanie inaugurated the Banque Internationale à Luxembourg (BIL) branch in Dubai. More about the bank, the purpose of the financial delegation, and a photo here. 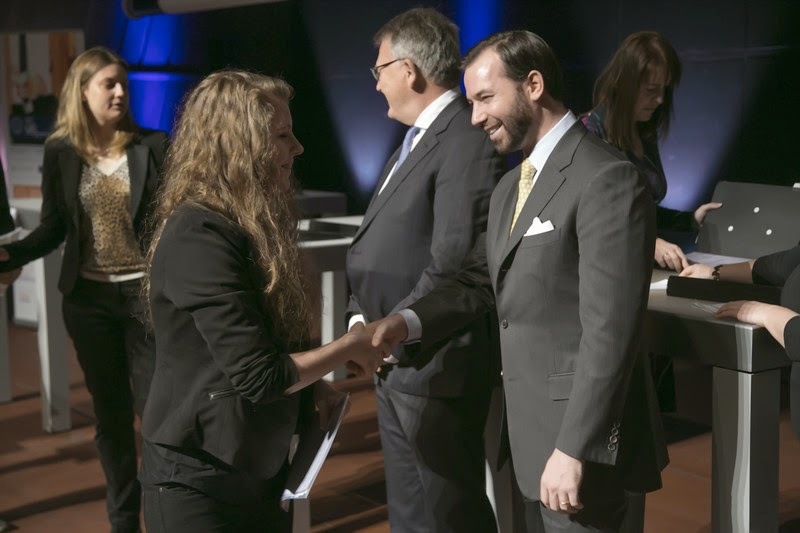 Before he headed off the Middle East for an economic mission, Hereditary Grand Duke Guillaume handed out 662 diplomas for successfully passed apprenticehship exams to some presumably very happy Luxembourgers, who just ended their apprenticeships in retail, industry, hotel business, gastronomy, service and the socio-pedagogical sector, on Sunday. 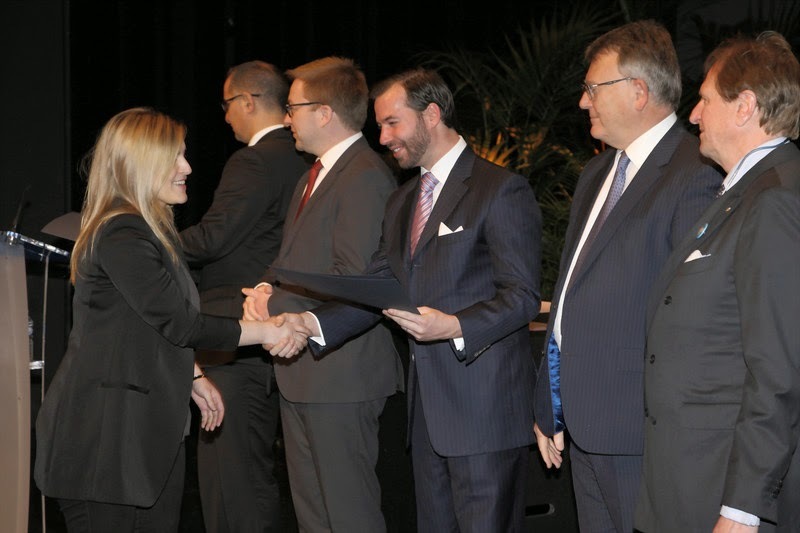 74 of the apprentices were awarded with the special Promotion du Travail certificate for outstanding accomplishments. The Hereditary Grand Duke was accompanied by Minister Nicolas Schmit and Claude Meisch for the event. Pictures are available at Wort and the cour. 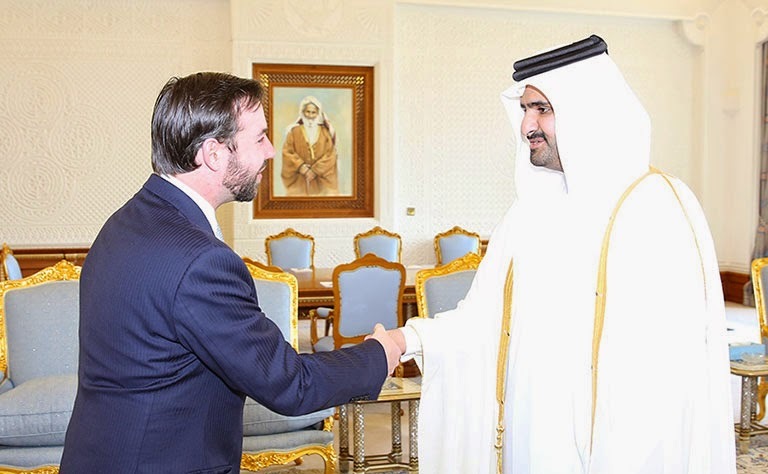 Hereditary Grand Duke Guillaume and Hereditary Grand Duchess Stéphanie are currently in the United Arab Emirates with a delegation of 60 representatives from Luxembourg. The goal is to forge stronger financial ties between Luxembourg and the Middle East and attract Islamic investors to Luxembourg. Minister of Finance Pierre Gramegna is accompanying them for the visit, which will include seminars organized by Luxembourg for Finance. 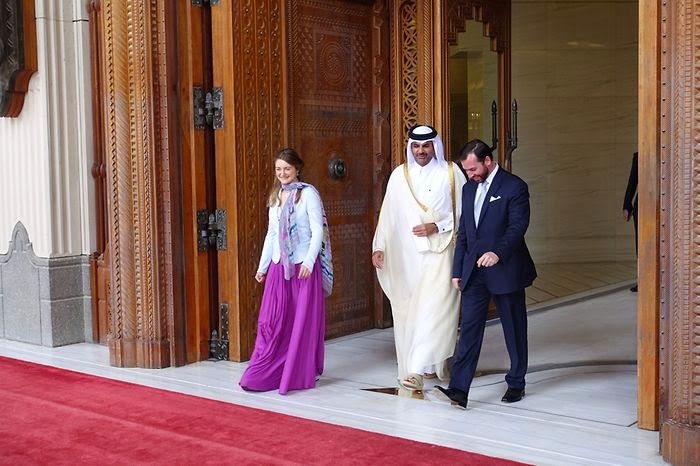 Hereditary Grand Duke Guillaume and Hereditary Grand Duchess Stéphanie are scheduled to be in Abu Dhabi and Dubai from March 1st to March 3rd and then travel to Qatar for a visit from March 4th to March 5th. More about the trip here and here. A photo that includes Hereditary Grand Duchess Stéphanie is also available from the Luxembourg Ministry of Finance's Twitter page. Today, Grand Duke Henri received Count Jacques Rogge, who served as the President of the International Olympic Committee (IOC) for twelve years between 2001 and 2013, for an audience at château de Berg, the Grand Ducal Family's residence. On the occasion, the Grand Duke awarded Count Rogge with the Grand Cross of the Civil and Military Order of Merit of Adolph of Nassau. Grand Duke Henri himself has been a member of the International Olympic Committe since February 1998 following in his own father's footsteps. 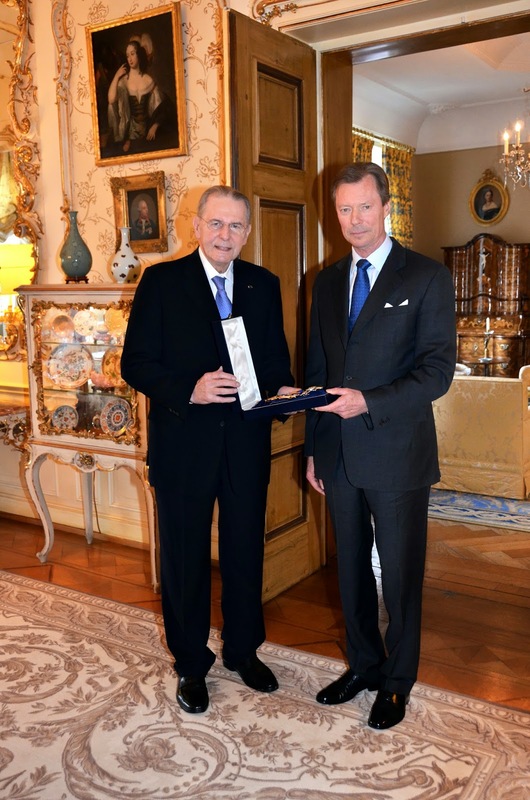 The Order awarded to Jacques Rogge recognises, in addition to foreign heads of state, individuals for their meritorious service to the Grand Duke, the Grand Ducal House and Luxembourg, as well as for their outstanding loyalty to the Grand Duke or his House. The order also rewards those who have excelled in the arts and sciences, as it does residents of Luxembourg or foreign nationals as a sign of benevolence. About time we added a new topic to the Luxarazzi 101 mix methinks and indeed we are going to do so with the dear relatives of the Grand Ducal and Princely Families. First up is the House of Kinsky that provided the Princely Family of Liechtenstein with not one but two Fürstins (or Fürstinnen for all you German-speaking people out there.) Plus, there were also two Liechtenstein princesses who married into the Kinsky family. So as you can see, the relations are numerous. In all reality, the Kinsky family's history can be traced back to around the year 1150 while they were firstly mentioned on May 16, 1237. The family's original name was Wchynsky after the village of Vchynice (or Wchinitz) in northern Bohemia. It later evolved via Chynsky to Kinsky, the latter one used since at least 1628. In 1596, Holy Roman Emperor Rudolph II confirmed the noble rank of the family and united the names Wchynitz and Tettau names in a so-called Letter of Majesty. In the same letter, the family is elevated from the rank of a knight to the rank of barons. Radslav Wchynsky, called "the Rich", was one of the ten richest and most influential men in the country at the time. It was due to his efforts that his family was ennobled by Emperor Rudolph II, who was in need of his support. The rise of the family to great prominence began in the turbulent era of religious conflicts between Catholics and Protestants which finally led Bohemia and Europe into the Thirty Years' War. Some of Radslav’s nephews took an active part in the war: While Wenzel was a Catholic and councillor and chamberlain of Holy Roman Emperor Matthias, his brother Wilhelm (Vilém) was a Protestant and friend and in-law of Wallenstein. While he did take part in the Protestant revolt against Holy Roman Emperor Ferdinand II, which culminated in the 1618 Defenestration of Prague, his friendship with Wallenstein saved him from the expropriation faced by other Protestant nobles. In 1628, he was even raised to the rank of a Count though murdered six years later alongside Wallenstein had Cheb Castle. He was the first one to take the name Kinsky. A third brother, Ulrich, also took part on the Defenestration of Prague but already died before the Battle of White Mountain. Wenzel's son Johann Oktavian entered the services of the Austrian crown just like his Catholic father had done. (Another family whose star began to rise around this time was in fact the Liechtensteins.) In 1676, the Emperor Leopold I confirmed the countly status given to his uncle of Johann Oktavian and his descendants. In the following decades, many Kinskys served the Habsburg rulers in the diplomatic and military services. One branch of the family was even elevated to the status of Princes of the Holy Roman Empire by Empress Maria Theresa in 1747. The members of the Kinsky von Wchinitz und Tettau family continued to occupy high military and diplomatic posts until the end of the Habsburg monarchy in 1918. After the end of the Second World War, estates of the princely (Choceň) branch of the family were confiscated under the Beneš decrees, as the late Prince Ulrich (1893–1938) was reproached with his declared German nationality and active collaboration with the Sudeten German Party. Estates of the other branches of the Kinsky family, Kostelec and Chlumec, which had been confiscated by the Nazis during the German occupation, were returned after 1945, but then confiscated again, this time by the ruling Communist Party in 1948. After the fall of Communism, several possessions were restored to the latter two branches of the family. And now onto the Kinsky-Liechtenstein relations: The first Kinsky to marry into the Princely Family was Countess Franziska Kinsky of Wchinitz and Tettau, who married Prince Alois II in 1831. Today's Princess of Liechtenstein, Marie, is also a born Countess Kinsky. The other way around, there were Princess Maria Josepha of Liechtenstein (1835-1905) who married Prince Ferdinand Bonaventura Kinsky (1834-1905) as well as Princess Maria Christina of Liechtenstein (1741-1819) who was married to Count Franz Ferdinand Kinsky (1738-1806). And if that still isn't enough for you, the maternal grandmother of Prince Hans-Adam II was also a born Kinsky.